When it says September on the calendar I immediately start thinking about cooler temps and cozy sweaters. 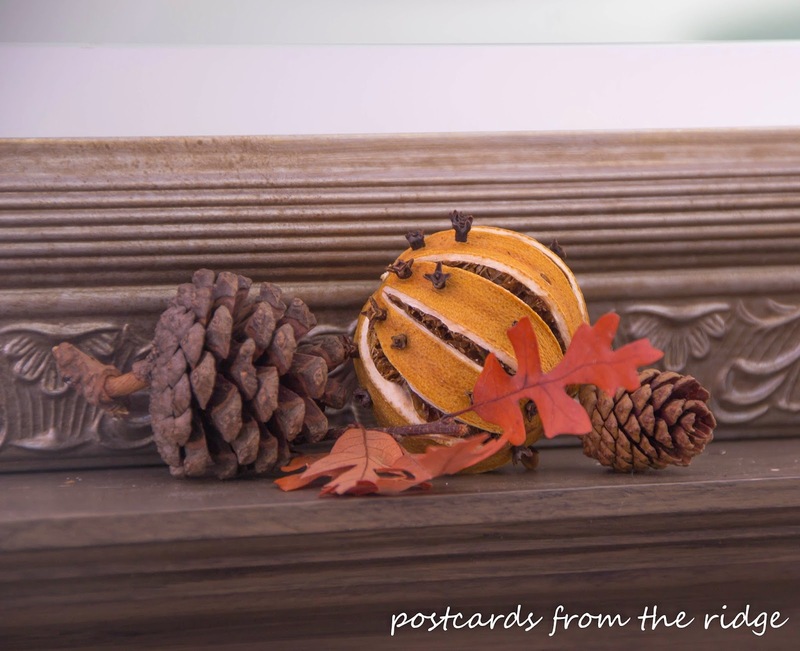 It's still fairly hot here so the sweaters will have to wait, but the fall decorations have already begun creeping their way out of storage and are gracing the mantels and breakfast room hutch. If you follow me on Instgram or Facebook you've been getting sneak peeks for the past couple of days. 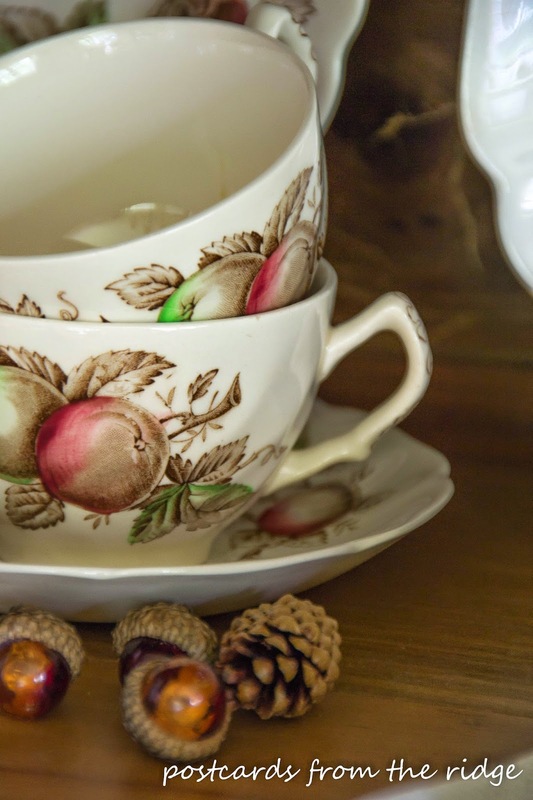 There's a definite vintage theme going on in our house and I didn't realize how much vintage decor I had until I started looking at the photos. I'm officially addicted to vintage items. Their character, their patina, and their history. If only they could talk! I got this old wooden crate at a tag sale a couple of years ago. I didn't notice the Charleston stamp on it until much later, but that makes me love it even more. It's an old roast beef crate. 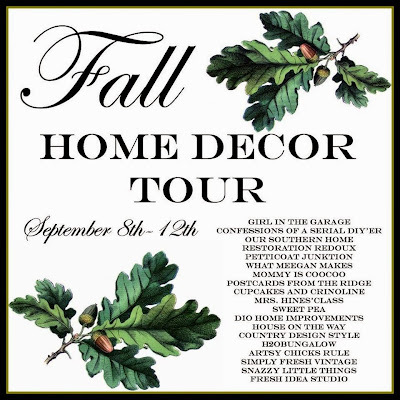 I'm joining some of my blog friends for a fall home tour this week. There are as many as four tours each day every day this week. 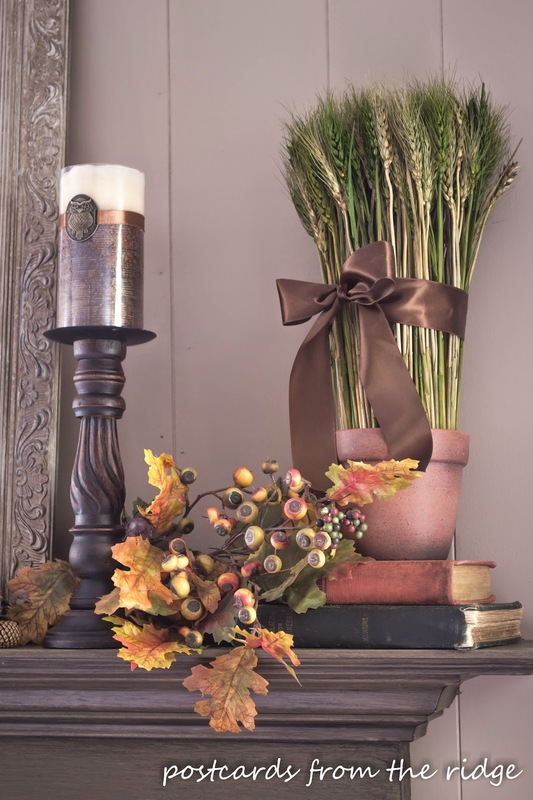 To see lots of fall crafts and decorating ideas click on the photos at the bottom of this post. Check back each day to see what has been added. And prepare to be inspired! There are touches of turquoise scattered throughout our home. This turquoise bottle came from Target. And although the other items look vintage, the crate is the only truly old thing here. 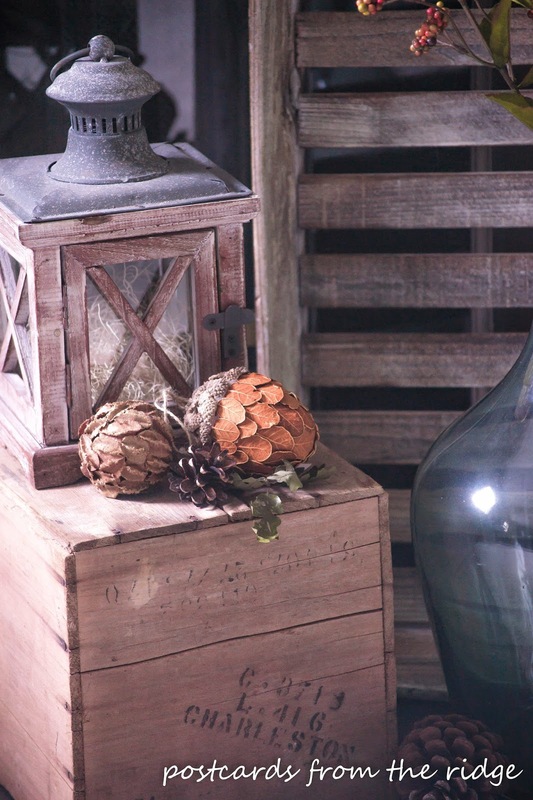 I love the wooden lanterns and have used them in several places throughout the house. To see other ways I've used turquoise as an accent in our decor, go here. The family room mantel. It's more formal than our living room mantel. Odd, yes, but that's the way it was when we bought the house, except the walls were wood paneling and the mantel was white (I changed it all, of course). I added some fall florals and leaves and some candlesticks to the top. Some faux pumpkins are added to the mix as well. Old books are inexpensive and are a great way to add some texture and height. Some small natural items fill in space here. Another old book and some faux fall leaves and berries round out the left side. 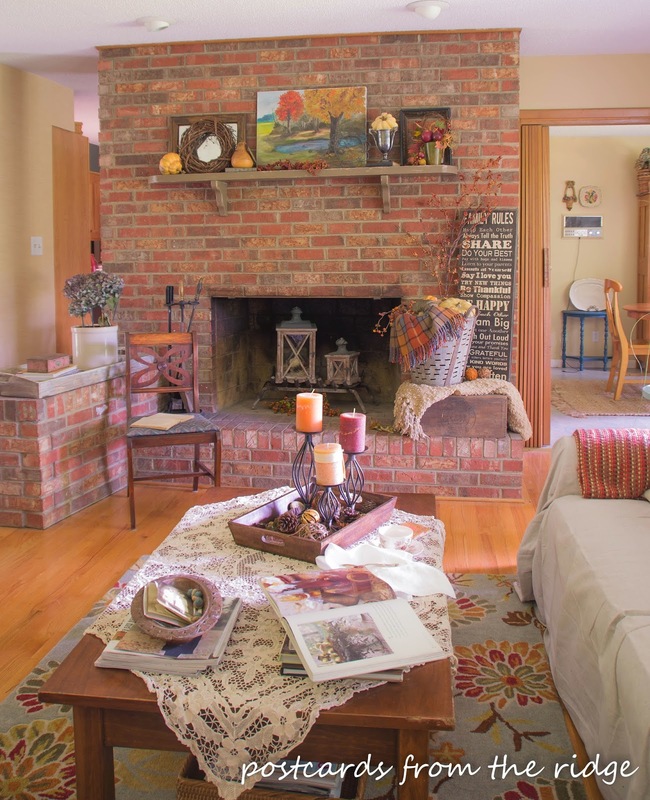 Faux pumkins and a wooden lantern on the left side of the hearth add some color and texture. The old wooden milk crate was a craig's list find. 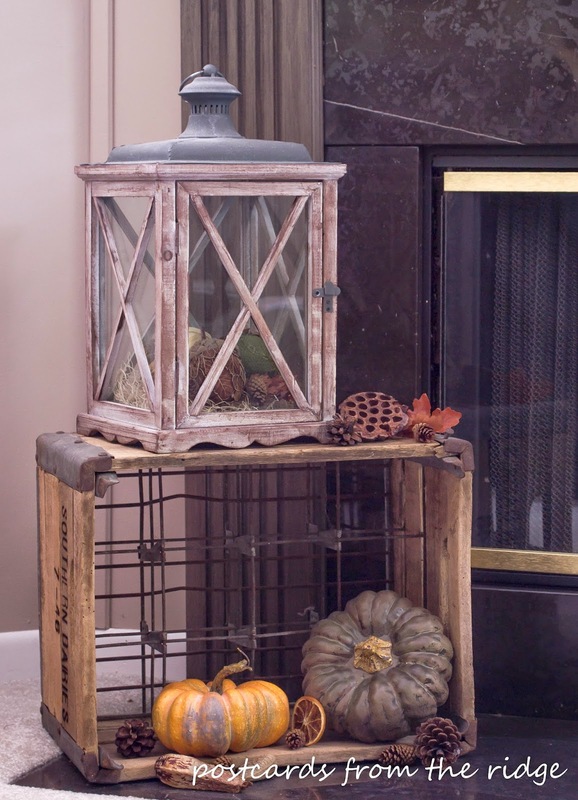 Who says you need pumpkins for fall decor? If they're not available, oranges work great too! The living room mantel is more difficult to decorate for some reason. Maybe it's because I'm not sure that I like all of that 60's brick. Possibly it's due to the fact that the mantel isn't really at the right height and it's too short for the fireplace. Whatever the reason, it gives me fits every year. I'll probably add a cute banner to it in the next couple of weeks, so stay tuned for that. For now it has an estate sale oil painting, a vintage mirror and frame, old books and some faux pumpkins on the mantel. Last year I tried three different versions of this mantel. Crazy, right? It was fun though. Here for a fun version where I used vintage games to decorate. The table in front of the sofa has a rummage sale lace throw and a few other fallish items. Fun fact: If you peek into the breakfast room through the door opening on the right you can see our groovy 1964 intercom system on the wall. It still works and we plug our ipods into it and play music throughout the house sometimes! 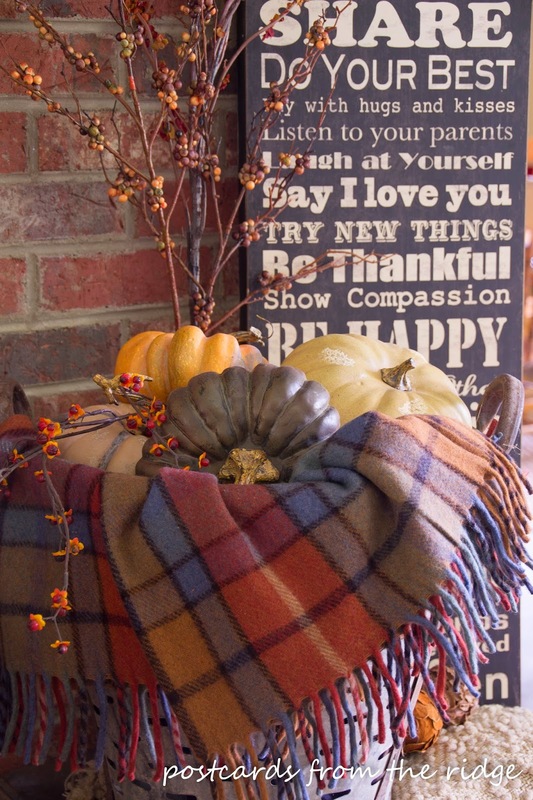 On the brick hearth there are some cozy throws, a vintage wooden Arm & Hammer crate, more faux pumpkins, and a fun sign I picked up a while ago at Hobby Lobby. This colorful wool throw has me looking forward to cooler temps so I can wrap up in it. It's not old, but I am in love with the fall colors in it. 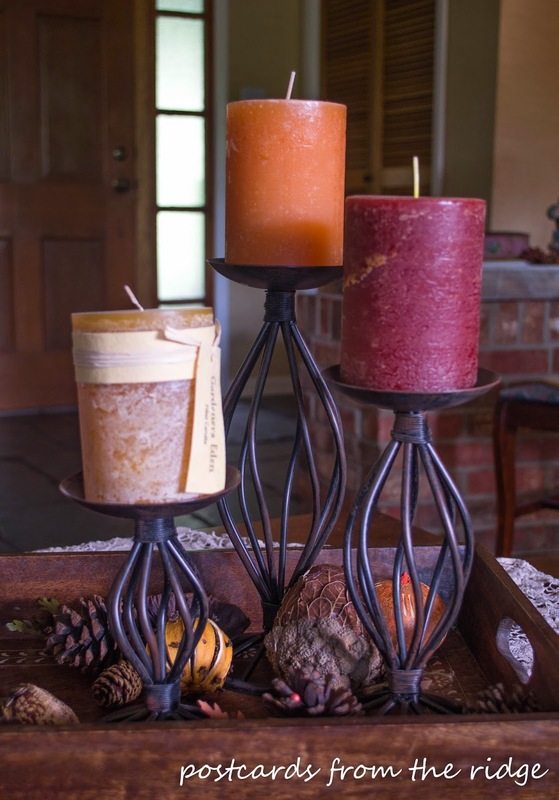 Some fall colored candles and natural fall decor sit on top of the coffee table. 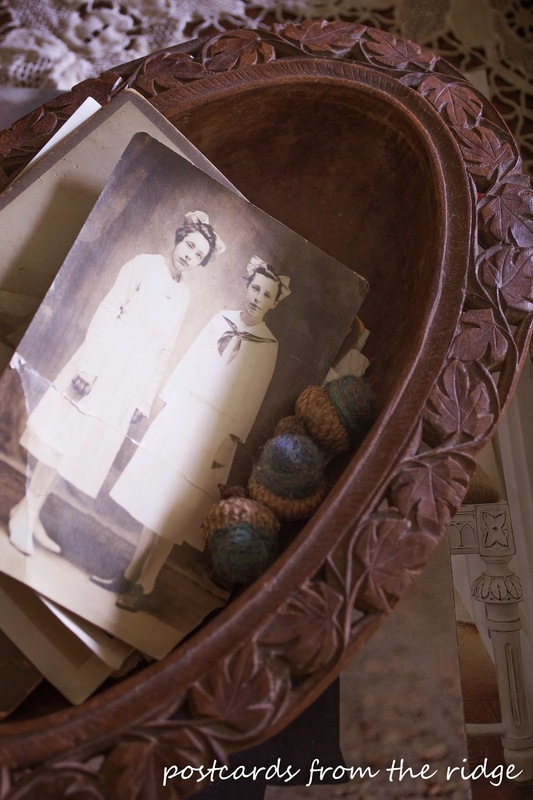 An old carved wooden bowl from a yard sale holds pictures of my husband's grandmother and her twin. Don't you love old photos? The felted wool acorns came from etsy. This old camera came from an estate sale a couple of years ago. My oldest daughter had it in her room, but she's away at college now and won't even know it's gone (shhhh! don't tell her). The glass acorns are an etsy find. They're so beautiful with the sunlight streaming through them! Over in the breakfast hutch are some junk store and thrift shop dishes. The vintage Johnson Brothers Harvest fruit dishes were boxed up and filthy. After a good soapy washing they looked perfect. The ironstone platters and pitchers are from thrift stores, flea markets, yard sales, and rummage sales. There are a few newer items mixed in, but I'll never tell which ones! 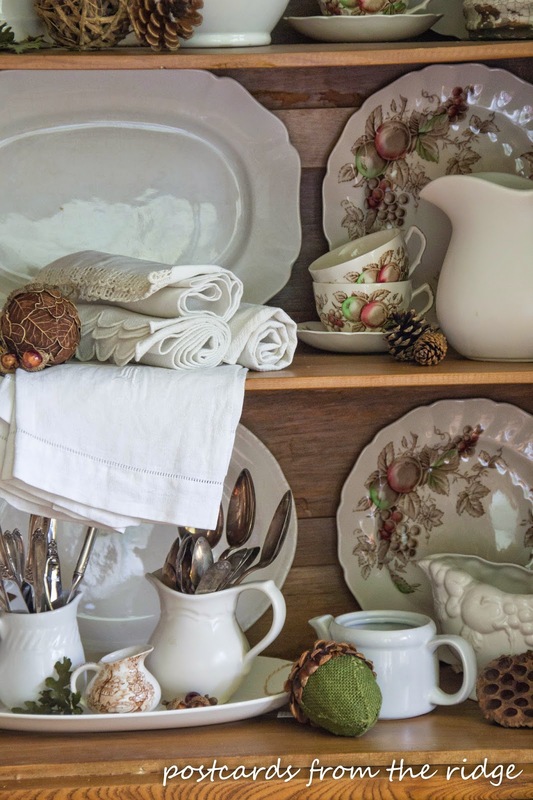 Vintage linens from the flea market and old silverware add sparkle and texture to the hutch. The cute little brown transferware creamer came from a yard sale. The colors in the junk store dishes are so pretty. They get displayed in the hutch each fall. 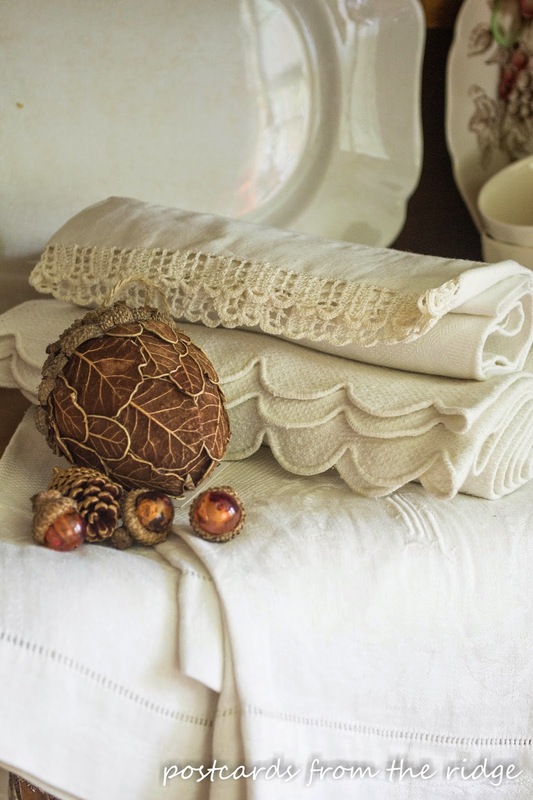 The linens are usually stored in a closet, but I got them out for fall and they add a nice soft touch to the hutch. 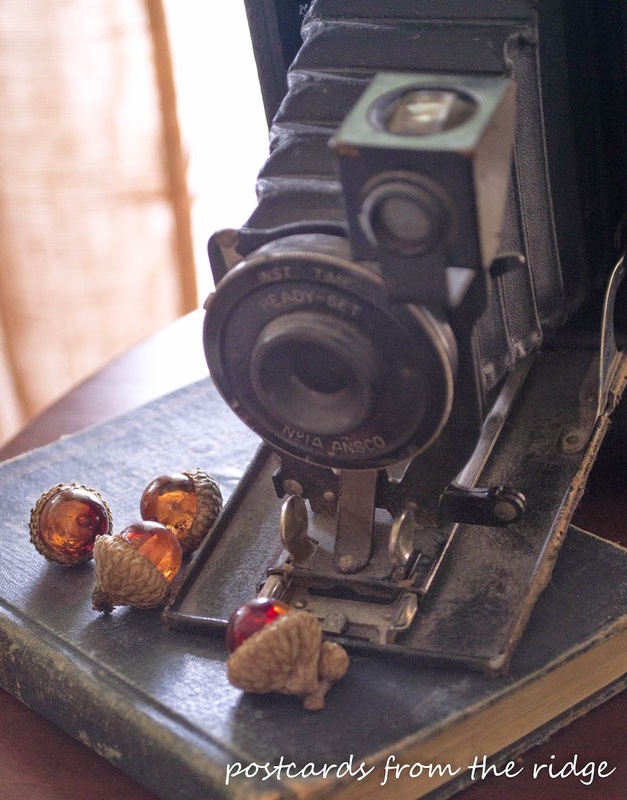 The glass acorns add shimmer and more texture and color. 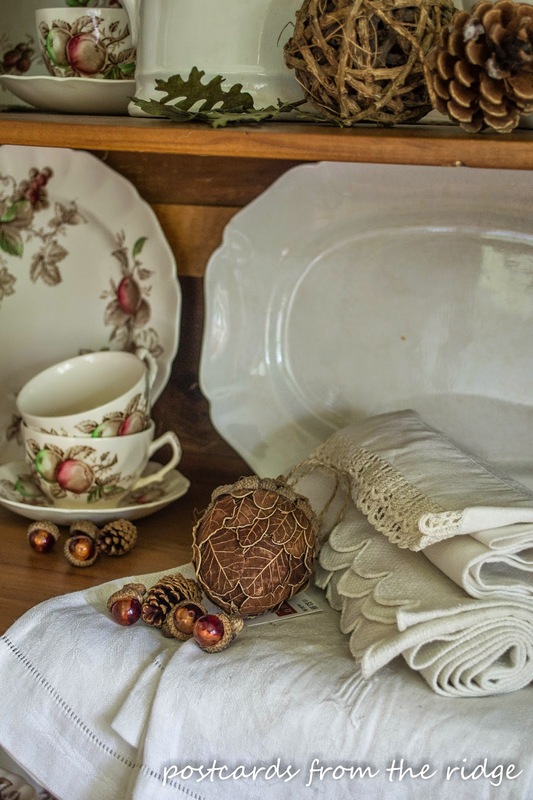 The vintage ironstone platter from Goodwill makes a nice backdrop. The larger leafy acorn came from Michaels. 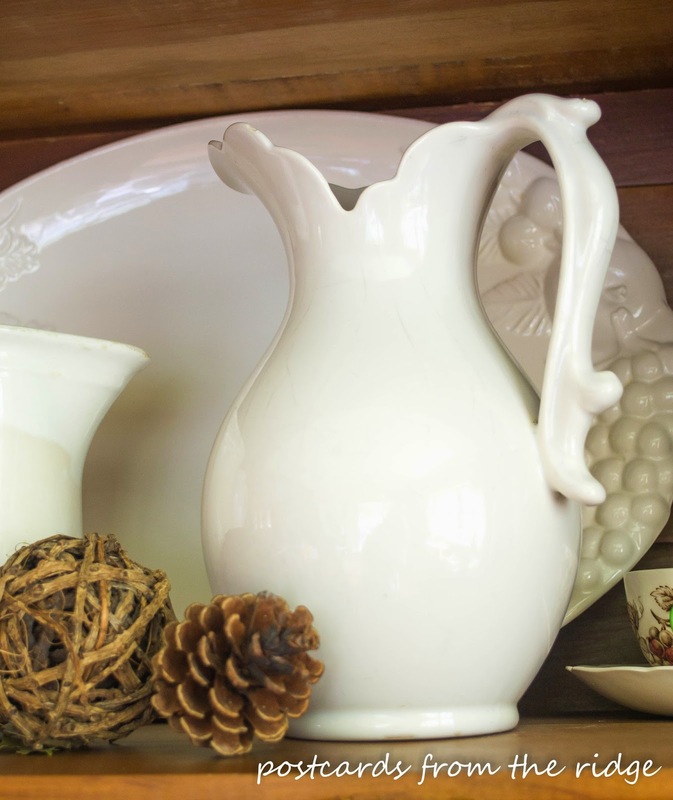 And possibly my favorite yard sale find ever, this ironstone pitcher makes me think of a sassy lady with her hand on her hip. Do you see it too? 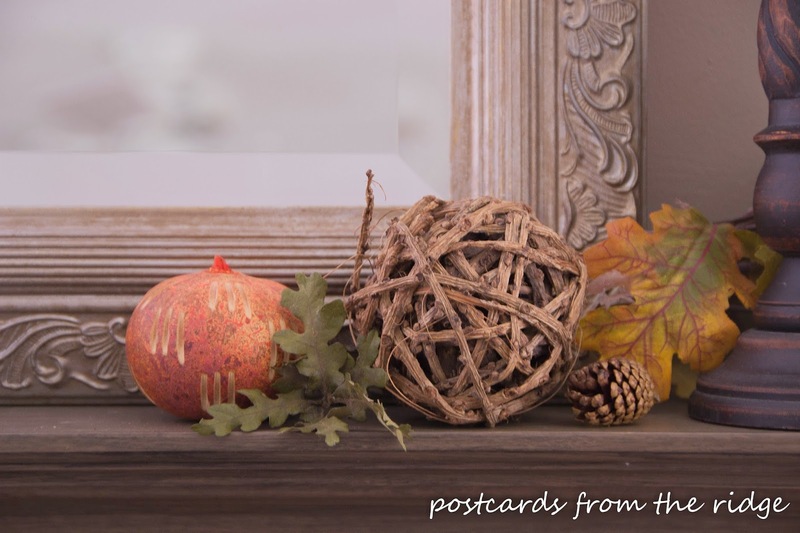 Pine cones and a twine ball add some fall texture. Do you go yardsaling, junking, or thrifting? It's apparently a genetic disease that runs in my family. My mom and sister do it, and now my daughters love to shop at the thrift store. I love it. It's like a treasure hunt and you just never know what you might find! What's the best thing you've found? Thanks for much for dropping by! And DON'T FORGET TO VISIT THE OTHER HOMES ON TOUR! Scroll down a bit further and click on any image to take you to that post. Enjoy the tour! DISCLOSURE: This post contains Amazon links for your convenience. 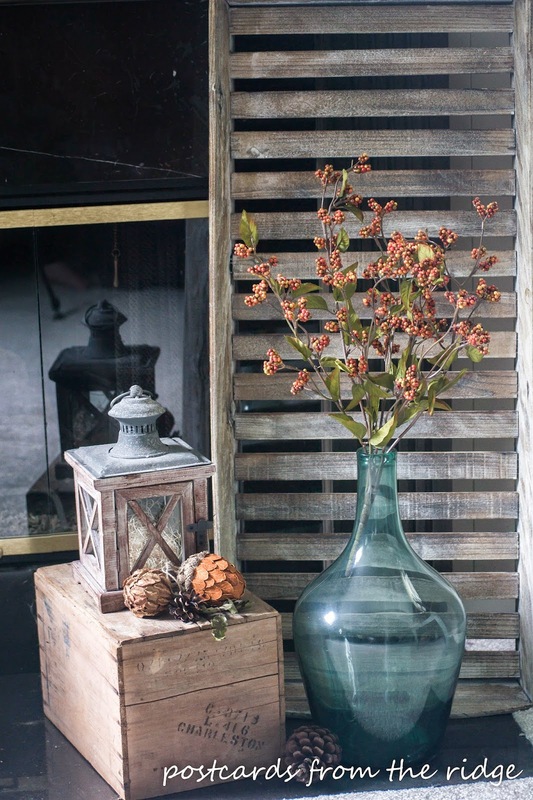 I love how you combine new with vintage in your décor. 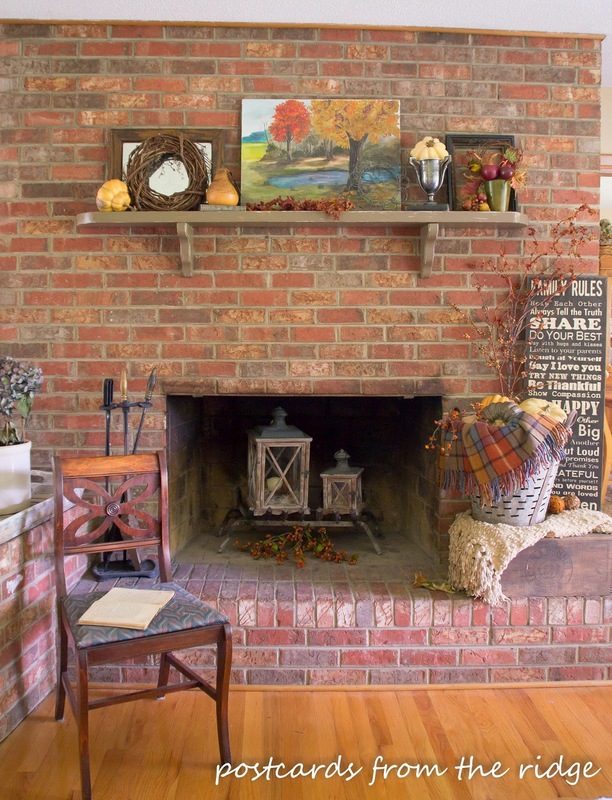 Everything looks perfect for fall in your home. Your 60's intercom system is so cool and it's amazing that it still works. Thanks, Paula! That intercom system is great during the holidays when we like to listen to Christmas music throughout the house! Thanks, Marisa. I've never been to goodwill.com. I'll definitely have to check that out! Thanks for the tip. You did a great job Angie!! 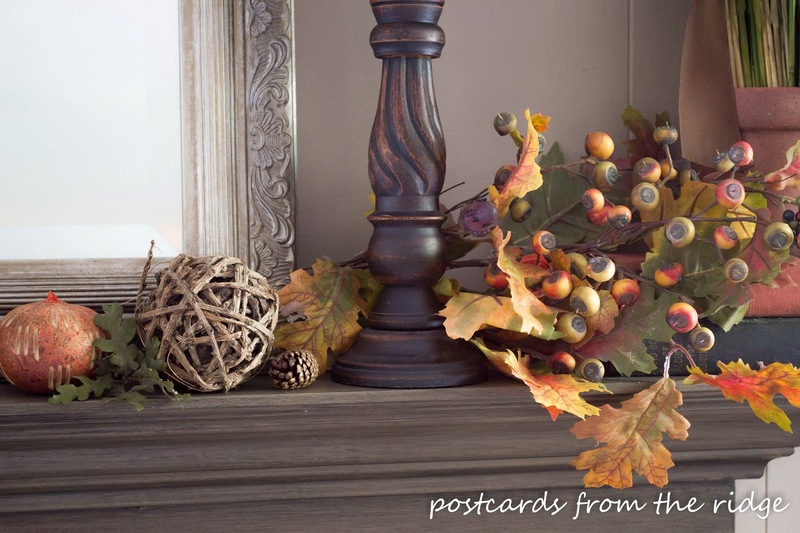 I feel completely ready for Fall after looking at your beautiful Fall decor everywhere!! Love it! Angie, Love how you used that blue bottle. Makes the whole display pop. Can't believe you have all that done already. You go girl! Thanks, Kathy. That bottle is one of my favorite things to decorate with. Thanks for dropping by! Angie your home seems so warm and welcoming. I love all of the vintage decor and the coziness of it all! 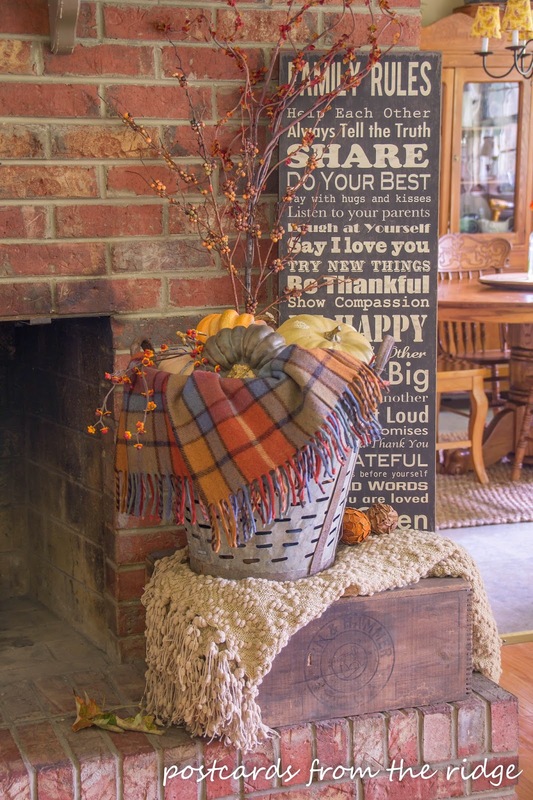 LOVE your fall touches, the acorns are a favorite for me and the olive bucket with that beautiful throw. PINNED! Your house looks gorgeous Angie! I love all of the warm rich colors you used! 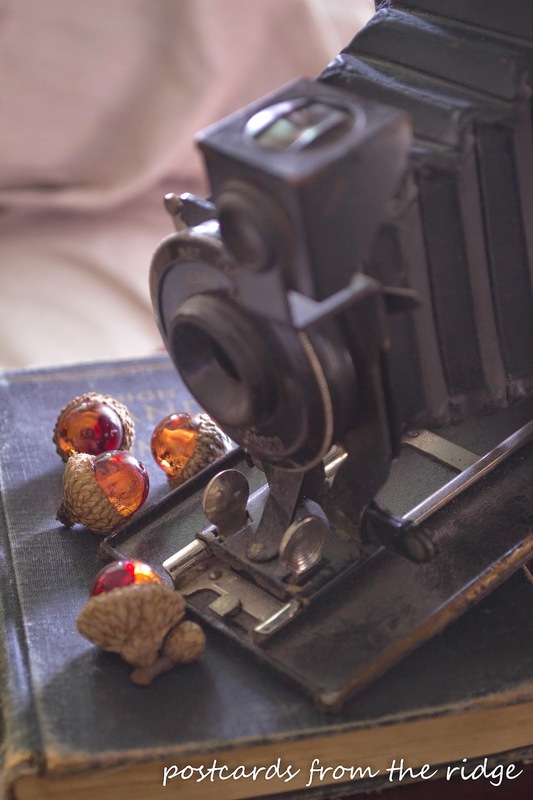 I'm going to have to get me some of those cute acorns from Etsy! 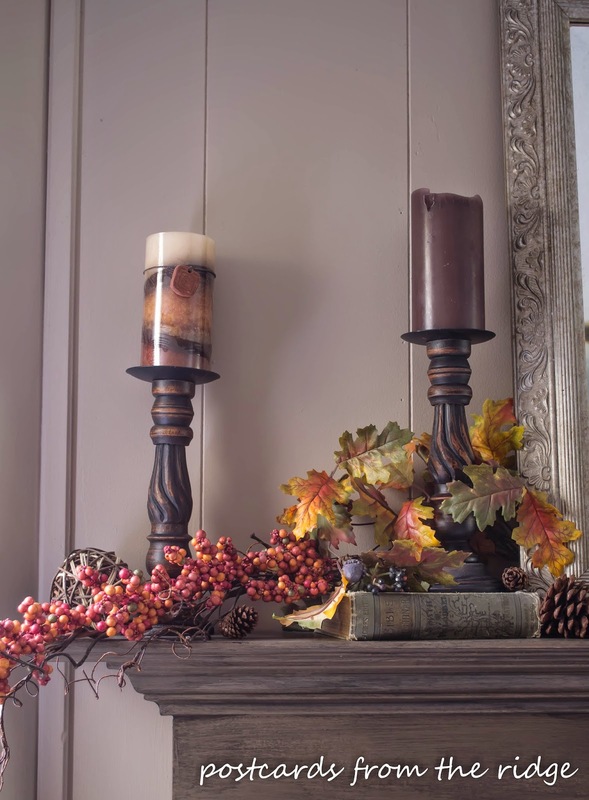 I just love everything, I mean everything about how you infused fall into your home! All of the little details are so charming and individual. I'm an old book lover as well for decorating.. can't get enough of them! Nice job on everything !! Enjoyed your fall tour so much Angie! You have a gift for combining the new with the old! And I'm really crushing on that throw so that I can curl up with it within a month or so! Love, love, love your fall tour. 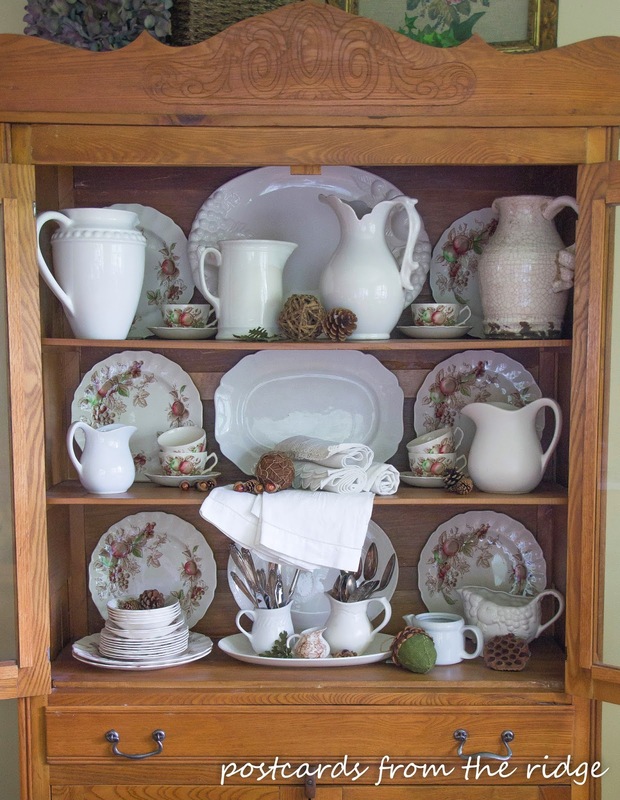 I love how you dispalyed your Havest Time Ironstone dishes. You are right, we do have good taste. You have created a beautiful space to welcome fall. 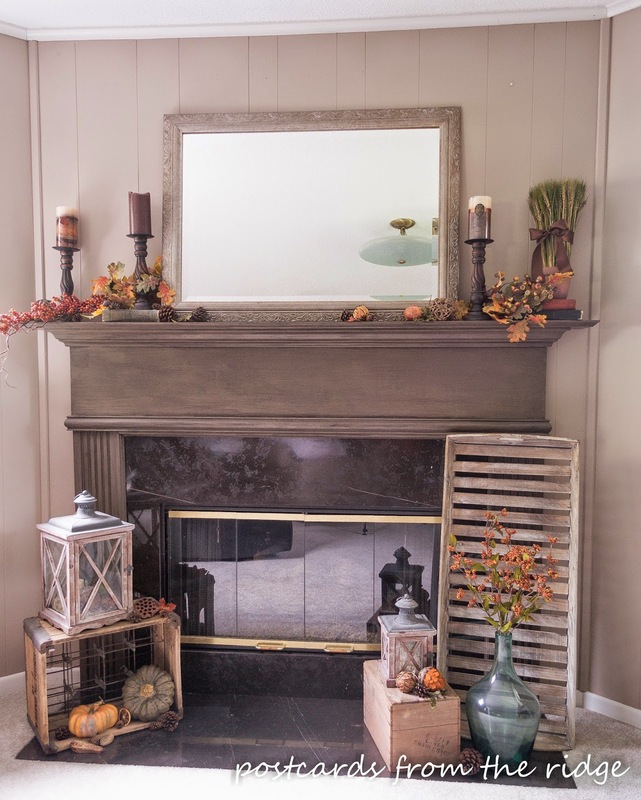 Your fall decor is absolutely gorgeous. I love the vintage theme. Beautiful! I love everything about your home! Everything is simply beautiful! 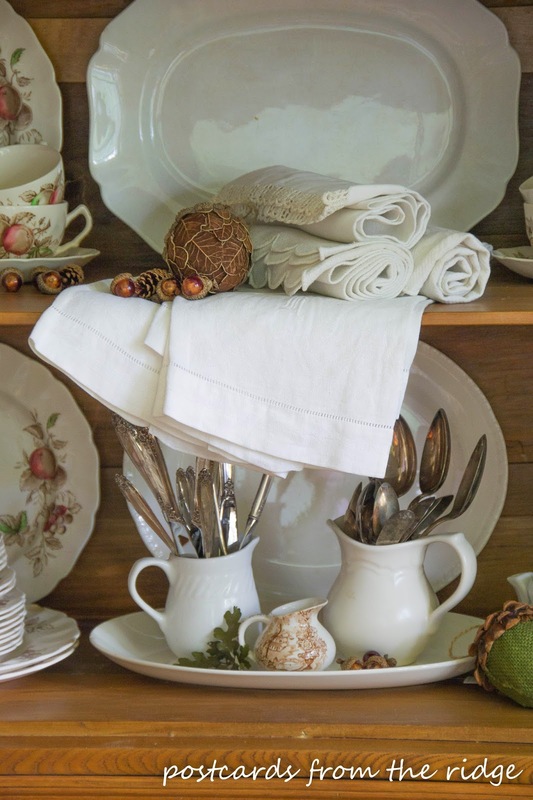 I love those Johnson Bros. dishes and sure wish I would make a find like that in a junk shop! Love the sign by the second fireplace and the plaid throw. Thanks for the inspiration! Love all your fall decorations! Everything looks so cozy! May I ask where you got your plaid throw? I have been looking high and low for one and can't find any! Thanks! Thanks Susan! I looked for a plaid throw in fall colors forever and finally found it on amazon of all places! Here's the link if you're intetested ==> http://amzn.to/1VRIz0E. It only took a few days to get here and I love it for fall. Thank you so much for the link to your throw. It's exactly what I have been searching for! Happy fall!